Provides beneficial heat retention during weight training and conditioning programs for low back muscles, hamstrings, groin, hips, quadriceps and waist. The 800 Trunks feature the original 1/8” neoprene; The 850 trunks are 1/16" neoprene. 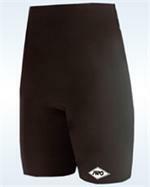 ¼” thick neoprene, sculpted, to fit the groin area and features a hook-and-loop fastening system that allows easy application. Quickly adjusted by the wearer. Stays in place without slipping. Reusable and economical. NOW AVAILABLE IN 6” WIDTH for today’s bigger athletes. Utilizing the same unique knit elastic used in the 3” and 4” wraps the new 6” wrap is an extra foot longer at 15’ in length. It’s ideal for use on groin strains, hamstring and quad strains. Beneficial in the treatment of thigh and groin pulls. 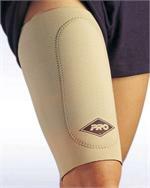 Sleeve provides uniform compression and support. Addition of a “pull pad” to the sleeve provides increased heat when placed over the injury area.